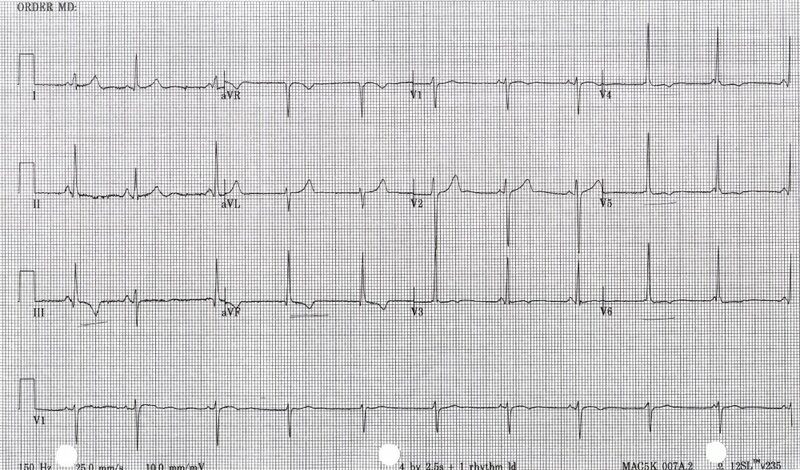 Last week I posted a red herring of an EKG in EKG of the Month. It was a diversion, interesting in its own regard, but a diversion from the true situation all the same. What do we see? Flipped T-waves in the anterior and lateral leads, poor, even odd R wave progression, short possibly even absent PR intervals and bradycardia. It’s kind of ugly. One would expect the patient to be experiencing some sort of symptom of cardiac compromise. Nada, nothing. Here’s the presentation: 28 year old, 6 months post-partum, comes in with progressive left-sided weakness. Had been seen at the PCP earlier in the weak and given scripts for muscle relaxants and steroids on the idea this was a muscloskeletal issue. Patient decided to come to the ER after dropping her child due to the weakness (the kiddo was fine). The above EKG was shot prior to her going to CT for a head CT, followed by another imaging modality: MRI. Both show a bilateral ischemic event, right greater than left, mostly in the frontal and prefontal area with some scattered subcortical spots as well. Big time, acute ischemic CVA. So what’s up with this EKG? Neurogenic T wave inversion. I found several articles on Ovid about this phenomenon. According to one article, 74% of patients with cerebrovascular incidents exhibit alterations in cardiac depolarisation and repolarisation. Most commonly these cardiac alterations are in things like prolonged QT intervals, T wave inversion, ST segment changes and abnormal U waves. This possibly is caused by unbalanced autonomic control due to the location of the ischemic events. The most common culprit is the insular cortex located within the lateral sulcus, overlaid in some parts but the frontal lobe – where the were several ares of ischemia. Now I can’t say for sure that this area was damaged, and judging by the literature, usually the alterations are more defined and substantial. Now here is where it gets really interesting. Why would a 28 year old have an ischemic CVA. No history of hypertension, no cardiac history to note, normal birth, but an aunt who had a similar event at the same age. Carotid and cerebral angiography was performed giving the diagnosis of moyamoya disease. Simply put, moyamoya is a progressive occlusive disease that causes stenosis of the carotids and the Circle of Willis. Leading to occlusion of the vessels. A large collateral network does form and sometimes retrograde filling of the cerebral arteries is seen as well. True diagnosis is through angiography where there is a “puff of smoke” appearance to the cerebral vasculature. Most folks don’t even know they have it until they have an event of some variety. 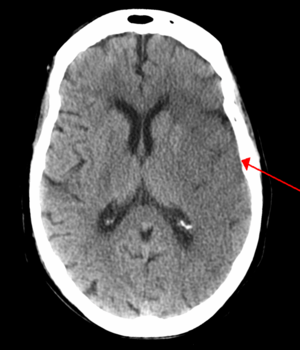 Much of the time it is a TIA type, but sometimes it comes as a large cerebrovascular event. Moyamoya is also a leading case of stroke in children, even very young kiddos. The consensus is that it is genetic and considering that the patient’s aunt suffered a similar event, coincidence aside, that looks pretty solid. So what happened? Since we are a nationally recognized stroke center, the patient admitted under our stroke protocol. Through the first night and later on they would have alterations in their rhythms, running junctional rhythms, SVT and sinus tach along with normal sinus rhythm. The biggest deficits was to the left arm with some mild to moderate in the left leg. She didn’t experience any expansion of the ischemic areas during her time on our floor and was relatively stable. Prior to heading to a rehab floor, referrals were given for surgical consultation through Stanford for a surgical solution to her disease. I think this was a case of the long-tail of medicine. Happy had a post about this and it sparked this post as well. We get so used to seeing this kind of EKG in a totally different light that a new perspective sometimes throws us way out of whack. I showed the EKG to a fellow EKG nerd and the first thing he asked was, “Did you call the doc over this?’ I explained the situation and the lights went on. I had no clue about moyamoya prior to this, so it was a huge learning experience for me. Fascinating and a little bit sad as well. There you have it. Hope you enjoyed this round of EKG of the month. Hopefully next month there will be a crazy cardiac one…well maybe not, that would mean bad things might be happening.